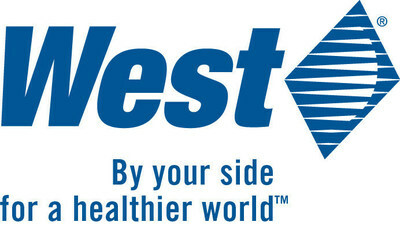 West Announces Third-Quarter 2017 Results | West Pharmaceutical Services, Inc.
EXTON, Pa., Oct. 26, 2017 /PRNewswire/ -- West Pharmaceutical Services, Inc. (NYSE: WST) today announced its financial results for the third quarter of 2017, updated financial guidance for the full-year 2017, introduced sales growth outlook for full-year 2018 and reaffirmed long-term financial targets. Reported net sales of $398.2 million grew 5.7% over the prior-year quarter. Net sales at constant currency (organic) grew by 3.7%. Third-quarter 2017 reported-diluted EPS was $0.67, compared to reported-diluted EPS of $0.50 and adjusted-diluted EPS of $0.53, both in the prior-year quarter. There were no adjustments made in the third-quarter 2017. Hurricanes in Puerto Rico had a negative impact on third-quarter 2017 sales of approximately $2 million. At current low levels of operations at both our Puerto Rican contract manufacturing facility and Biologics customers located in the area, we estimate fourth-quarter 2017 sales to be adversely impacted by approximately $5 million. Raising full-year 2017 sales and adjusted-diluted EPS guidance. Full-year 2017 sales guidance is expected to be in a range between $1.595 billion and $1.605 billion, compared to the prior guidance range between $1.585 billion and $1.600 billion. This includes hurricane-related impacts in Puerto Rico. Full-year 2017 adjusted-diluted EPS guidance is expected to be in a range between $2.74 and $2.79, compared to the prior guidance range between $2.66 and $2.73. This includes an estimated fourth-quarter 2017 adjusted-diluted EPS negative impact of $0.03 from hurricane-related issues in Puerto Rico. Both current and prior guidance ranges include the favorable impact from tax-related benefits associated with share-based payment transactions that have been recognized during the first nine months of 2017. Providing long-term financial objectives consistent with prior plans. "Our third-quarter performance was in line with our expectations," said Eric M. Green, President and Chief Executive Officer. "We are on track to finish 2017 with strong organic sales growth led by high-value product growth in the Biologics and Generics market units. "Looking to the future, we continue to see positive fundamentals in the markets we serve. We see unit volume growth from existing injectable drugs, future new drug approvals, and new generics and biosimilars that are entering the market. There is continued growth potential for high-value product (HVP) adoption in all our market units – Pharma, Generics and Biologics – as customers strive for higher quality and increasingly adopt zero-defect strategic imperatives. We have successfully focused our Contract-Manufactured Product segment on serving injectable medicines and diagnostic customers, and our consumer goods business continues to become a smaller part of that segment's sales." Mr. Green concluded, "I am proud of our employees and their dedication to safety, quality and innovation. All of us at West are aware of the critical importance that our products play in the integrated containment and delivery of injectable medicines. I am especially proud of their response during this severe hurricane season. With a strong global team, focused on helping our customers, we are well-positioned for the future." Reported net sales were $398.2 million, compared to $376.7 million. Reported net sales growth was 5.7%. On a constant-currency basis, organic sales growth was 3.7%. Proprietary Products segment reported net sales were $308.9 million, compared to $298.1 million. Reported net sales growth was 3.6%. Organic sales growth was 1.5%, led by low-single digit growth in the Biologics and Generics market units. Biologics sales growth was lower than anticipated due to customers in Puerto Rico unable to receive shipments. Excluding this impact, Biologics organic sales growth would have been in the mid-single digit range. Generics market unit organic sales growth was positive after three consecutive quarters of declines. Pharma market unit sales declined low-single digits after a strong first-half 2017 performance. Committed orders in the Proprietary Products segment at September 30, 2017, were $375 million, a decrease of 6% at constant currency compared to September 30, 2016. Contract-Manufactured Products segment reported net sales were $89.3 million, compared to $79.0 million. Reported net sales growth was 13.1%, and organic sales growth was 11.5%. Gross profit margin was 31.4%, a decrease of 70 basis points. Proprietary Products segment gross profit margin was 35.8%, a decrease of 60 basis points due to lower sales growth of high-value products, increased labor and overhead costs, partially offset by production efficiencies. Contract-Manufactured Products segment gross profit margin was 16.3%, an increase of 30 basis points due to a favorable mix of products sold and higher sales volume, partially offset by increased labor and overhead costs. Third-quarter 2017 reported operating profit was $63.9 million, which represented an operating profit margin of 16.1%, an increase of 250 basis points from the prior-year quarter. The major driver of margin expansion was Proprietary Products other (income) expense, as the Company recognized $9.1 million of income for reimbursed costs associated with a technology that was subsequently licensed to a third party. Income tax expense in the quarter was $14.0 million, which represented an effective tax rate of 22.3%. The effective tax rate reflects the impact of a tax benefit of $4.8 million associated with tax benefits from the adoption of guidance issued by the FASB regarding share-based payment transactions. Excluding the impact, the effective tax rate would have been approximately 30%. The Company is maintaining its full-year 2017 constant-currency (organic) sales growth guidance of approximately 6%. *Includes the reported-diluted EPS impact of $0.40 for the first nine months of 2017 tax-benefit associated with the previously-discussed adoption of FASB-issued guidance. Also includes an estimated adverse impact due to severe-weather issues in Puerto Rico of approximately $5 million of net sales (and impact to consolidated gross margins) and $0.03 of adjusted-diluted EPS. The principal currency assumption used in preparing these estimates is the translation of the euro at $1.18 for the remainder of 2017, compared to a prior assumption of $1.14 per euro. Excluding the impact from tax benefits associated with the previously-discussed adoption of FASB-issued guidance, the Company expects that its annual effective tax rate will be approximately 30%. The Company does not plan on forecasting future benefits as they could vary quarter to quarter with the time and size of stock option exercises. Instead, the Company will include the impacts with each reported period. As a point of reference, the Company would have had $0.8 million of net income benefit in the third quarter of 2016 and would have had $18 million for the full-year 2016, resulting in an EPS benefit of $0.01 in the third-quarter 2016 and $0.24 for the full-year 2016. The Company estimates its 2017 capital spending to be approximately $150 million. The Company expects 2018 constant-currency, organic sales growth to be in the range of 6% to 8% as a result of market volume growth and continued HVP conversions. Biologics and Generics market units are expected to return to more typical levels, with growth moderation in Contract-Manufactured Products following a strong 2017 and continued portfolio management of the consumer goods business. The Company's long-term financial construct remains consistent with prior plans, with 6% to 8% annual constant-currency, organic sales growth. We expect incremental sales growth from proprietary delivery systems such as SmartDose® and Crystal Zenith®, as their relative sales base increases over time. Favorable product mix shift, coupled with operational excellence and optimization programs, are expected to expand operating profit margins by approximately 100 basis points per year. Annual capital spending is expected to remain in a range of between $150 million and $175 million. The Company updates and shares its high-level, long-term objectives in order to help investors, employees and other stakeholders better understand the strategic value of current and planned capital and research and development investments. As such, the revenue and profitability goals are not intended to predict or estimate actual results in any future period, but to indicate management's view of what it believes to be achievable in that time frame. The Company will host a conference call to discuss the results and business expectations at 9:00 a.m. Eastern Time today. To participate on the call please dial 877-930-8295 (U.S.) or 253-336-8738 (International). The conference ID is 94093362. An online archive of the broadcast will be available at the website three hours after the live call and will be available through Thursday, November 2, 2017, by dialing 855-859-2056 (U.S.) or 404-537-3406 (International) and entering conference ID 94093362. Certain forward-looking statements are included in this release. They use such words as "expected," "reflects," "continue," "raising," "see," "increase," "plan," "will," "estimated," "remain," "may," "believes," "expect," "include," "estimate," and other similar terminology. These statements reflect management's current expectations regarding future events and operating performance and speak only as of the date of this release. There is no certainty that actual results will be achieved in-line with current expectations. These forward-looking statements involve a number of risks and uncertainties. The following are some of the factors that could cause our actual results to differ materially from those expressed in or underlying our forward-looking statements: customers' changing inventory requirements and manufacturing plans; customer decisions to move forward with our new products and product categories; average profitability, or mix, of the products we sell; dependence on third-party suppliers and partners; interruptions or weaknesses in our supply chain; increased raw material costs; fluctuations in currency exchange; and the ability to meet development milestones with key customers. This list of important factors is not all inclusive. For a description of certain additional factors that could cause the Company's future results to differ from those expressed in any such forward-looking statements, see Item 1A, entitled "Risk Factors," in the Company's Annual Report on Form 10-K for the year ended December 31, 2016. Venezuela deconsolidation – During the nine months ended September 30, 2017, as a result of the continued deterioration of conditions in Venezuela, as well as its continued reduced access to U.S. Dollar settlement controlled by the Venezuelan government, the Company recorded a charge of $11.1 million related to the deconsolidation of its Venezuelan subsidiary, following its determination that it no longer met the GAAP criteria for control of that subsidiary. As of April 1, 2017, the Company's consolidated financial statements exclude the results of its Venezuelan subsidiary. Restructuring and related charges – During the three months ended September 30, 2016, the Company recorded $2.3 million in restructuring and related charges, consisting of $1.4 million for severance charges and $0.9 million for a non-cash asset write-down associated with the discontinued use of certain equipment. During the nine months ended September 30, 2016, the Company incurred $23.7 million in restructuring and related charges, consisting of $7.8 million for severance charges and $15.9 million for non-cash asset write-downs associated with the discontinued use of certain trademarks and certain equipment. Venezuela currency devaluation – During the nine months ended September 30, 2016, the Company recorded a charge of $2.7 million related to the devaluation of the Venezuelan Bolivar from the previously-prevailing official exchange rate of 6.3 Bolivars to USD to 10.0 Bolivars to USD. Discrete tax item – During the three and nine months ended September 30, 2016, the Company recorded a discrete tax charge of $0.3 million resulting from the impact of a change in the enacted tax rate in the United Kingdom on its previously-recorded deferred tax asset balances. (3) Guidance includes various currency exchange rate assumptions, most significantly the euro at $1.18 for the remainder of 2017. Actual results will vary as a result of exchange rate variability.